Peach Cobbler, or, Dr. Quinn and Kentucky Hospitality. Guys, do you remember that amazing TV show Dr. Quinn, Medicine Woman? What am I talking about – of course you remember it, because it was awesome. You can go watch the opening song here, and then come back when you’re done. In that world, I could be a robber baron. In this one, I hope to some day teach their snobby children French. Sometimes I think my mom is actually Dr. Quinn. No, she doesn’t treat lots of scurvy, or wounds inflicted from wolves/skirmishes with Indians. She also hasn’t delivered her own baby after several nights spent in the woods. But she does receive a lot of food. Her patients were always bringing her food, and she in turn would bring it home to us. One of her long-time patients was a woman named Bernice, a woman who was the embodiment of southern grace and Kentucky charm. A key component of said grace and charm was that she was always showing up at our house with peach cobbler. I love cobbler. Any cobble. It is this perfect blend of fruit and cake, topped off with creamy ice cream. But I especially love this cobbler, because it is sweet and tart, gooey with a crispy top, and incredibly easy to make. Oh, and it is made out of peaches. PEACHES. We are in high peach season right now and I can’t get enough of them. I actually got stressed the other day about how to make and eat all the peach desserts I want to try before peach season ends. If summer had one taste, it might just that of a peach. Or pink lemonade. Or maybe hotdogs grilled outside. 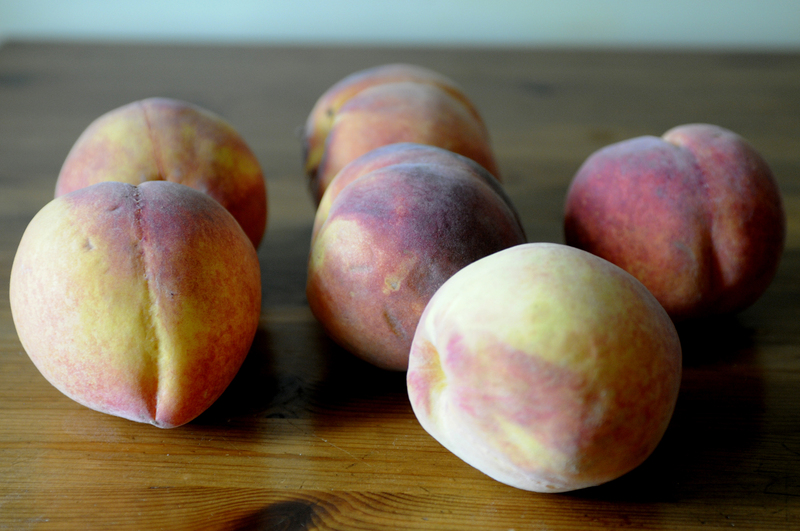 Ok, so I guess summer cannot be limited to just one taste, but still – peaches definitely rank high on the list. The summer before I got married, Bernice brought multiple peach cobblers by our house. I think she knew that my parents had all the complex emotions of marrying off their only daughter, and nothing helps complex emotions like peach cobbler. Yes, this is illogical. But in the south we know that the act of bringing someone food isn’t actually about the food itself. It is a way of saying, “I wish I could help you in whatever way you need helped. But I can’t, so instead I stood in my kitchen all morning thinking about you and here are my thoughts, baked and bubbly and ready to be smothered in ice cream.” I asked for the recipe right after moving to DC and I made it for James last year for his birthday. It felt like having just a little bit of Kentucky hospitality in my DC kitchen. Bernice passed away last year. She had lived one of those best lives, the type that might not be noticed by the media or noted in any annals of society, but is felt deeply by those that knew her. I want to live one of those lives, marked by the constant extension of quiet, unpretentious hospitality. I thought of her as I was making the cobbler this year. I thought of her generosity, her kindness, and her understanding that showing up with a peach cobbler can do a world of good. Peel and slice peaches. How many? Enough. You can never have too many peaches. My peaches were not super ripe, so I let them sit tossed in a couple spoonfuls of sugar. If yours are juicy and ripe, you won’t need this step. Pour peaches into greased 9×13 inch dish. Cut crusts off of white bread and arrange in criss-cross pattern over peaches. 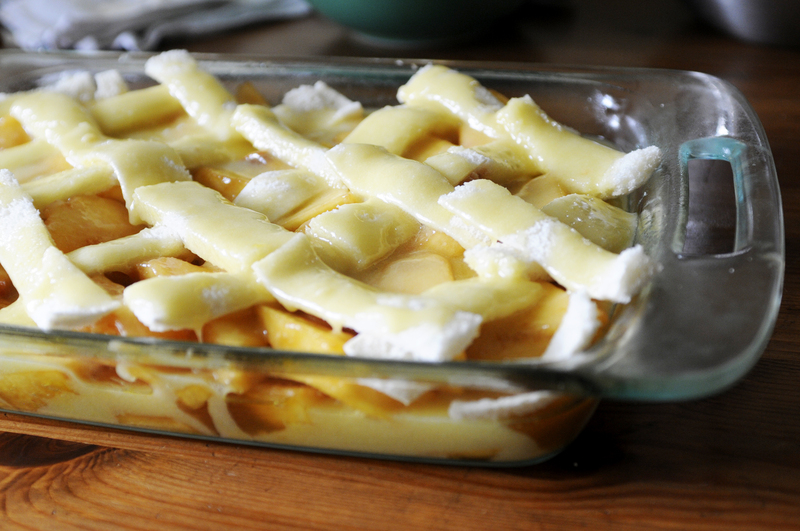 Mix together 3 Tablespoons flour, 2 eggs, 1 stick melted butter and 2 cups sugar and pour over cobbler. Bake at 350 until bubbly, with the bread a golden brown, approximately an hour. Let sit for about 45 minutes before serving. *In fairness to accuracy, there was finally an episode where the good doctor started laying down the law and asking to be paid in money. She just didn’t know what a good thing she had coming. This entry was posted in Uncategorized and tagged baking, dessert, food, photography. Bookmark the permalink. 25 Responses to Peach Cobbler, or, Dr. Quinn and Kentucky Hospitality. I loved that show! And I LOVE your post! Thanks! I found season one on DVD at my granny’s house a couple years ago and binged, and it was SO GOOD. 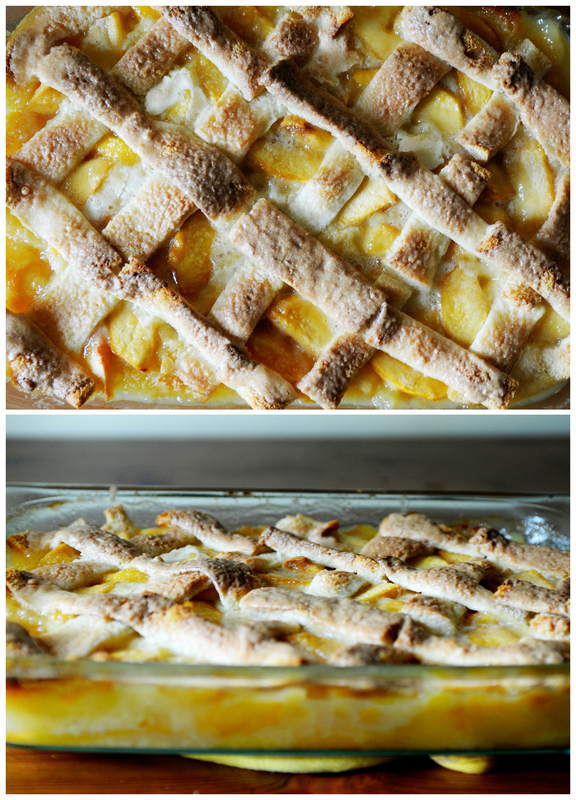 Never thought of making peach cobbler this way…..but now think I might have to try it. I’ve been encouraged by some women like Bernice as well – such beautiful souls. Also, white bread cobbler topping? Love it. Isn’t it the best? And so easy! I just want to be sure I’m reading this right: flour, eggs, 1 stick melted butter, and 4 more sticks butter? Oooopss- Thanks! No, 2 cups sugar. Obviously, I was letting my inner-butter lover dictate my typing. : ) Thanks for catching it! Loving every one of your posts! Can’t wait to try the recipe. One quick question. Is it 1 stick butter and another 2 cups butter? Or is that suppose to be sugar? Thanks!! Sorry, just saw the comment above! Love your blog. 🙂 I put a link for it in my blog, but instead of your profile picture, a WordPress icon is shown, differently from other blogs I added. I just thought I might let you know that, maybe there is something to be set up in your dashboard. Hmm….. I don’t know why…. But I am also super technologically dumb, so I am not sure how to change it. But thanks for the link all the same! i LOVE reading your blog! (I am a friend of James’ mom.) Your posts literally give me goosebumps (or tears…or sometimes both!) because of the way you use words. My favorite words today: “I wish I could help you in whatever way you need helped. But I can’t, so instead I stood in my kitchen all morning thinking about you and here are my thoughts, baked and bubbly and ready to be smothered in ice cream.” Delightful and beautiful at the same time. AND thanks for sharing the recipe! Whenever I think of peach desserts, I always think of my dear grandmother saying, “I am very fond of peach pie.” I think I liked her to say that because people don’t use the word “fond” very liberally these days. Ok, this sounds amazing!! I am confused by the directions, no. 3…mix 1 stick melted butter and 2 cups of butter….. is that right? Absolutely love this. While I’m not one of those people who claim they “hate cake,” I’m a pie person at my core. A peach pie person, specifically. (And alliterative, apparently). Dr. Quinn was shot right near I grew up, in Thousand Oaks! (The tv show, not Jane Seymour. I’m sure she’s still going strong). I never really watched it, but if she’s going around delivering her own baby, maybe I missed something good! Georgia peaches are the very best kind!!! My dad’s family is all from Georgia and we always stocked up whenever we were there in the summer. LOVE those peaches! SULLY FOREVER. That open dingy shirt? Those wolves that followed him around? The wavy hair and smoldering eyes? Be still my soul. How perfectly you explain the southern desire to take food! That’s just it and its ingrained in us along with please, thank you and maam! I absolutely loved that show! I actually bought all of the seasons on DVD. Thanks for bringing back the memories. I always enjoy reading your posts! You’re a very talented writer/photographer. 🙂 keep up the good work!